The other Crystal Palace – in Victoria Street | London My London | One-stop base to start exploring the most exciting city in the world. But it is the building on the right of the same photo (and in the etching immediately above) advertising Zulima – the strongest woman in the world, since you ask – that knocks one for six. Built on the ground now occupied by the Methodist Central Hall it was the Royal Aquarium, a huge building inspired by the only slightly bigger Crystal Palace, housing all sorts of entertainment (except fish and royalty). It sported a very large angled glass and iron roof, clearly influenced by the Crystal Palace, and a grand hall which was 340 feet long and 160 feet wide. Arthur Sullivan looked after the music and Millais the paintings. It housed a 400 piece orchestra, a large reading room, chess room, a roller skating rink, a palm court, exotic trees, fountains and the biggest collection of circus and freak acts you would find anywhere. These included the tightrope walker, the Great Farini, Zazel, the human cannonball, and a music hall where George Robey made his debut. 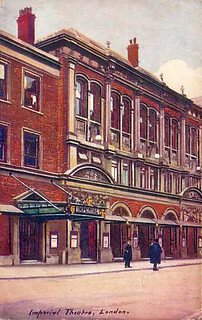 Next door was the Acquarium Theatre, later re-named The Imperial Theatre (above, right) before being demolished in 1907 brick by brick and rebuilt as the Imperial, Canning Town eventually becoming the Imperial Cinema before being burned down in 1931. 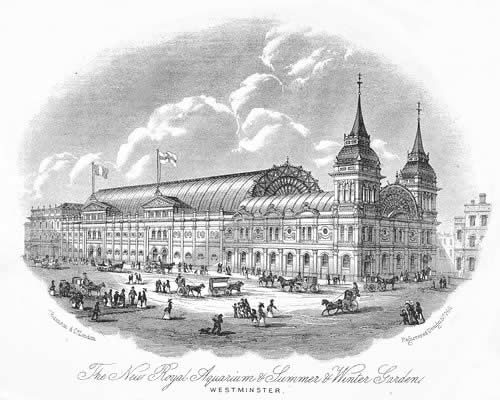 The noble vision of the Royal Acquarium was for a building of “public instruction and entertainment” but this didn’t stop objections from nearby Westminster School which was worried “there would speedily gather round the place persons and associations of a character calculating to be seriously detrimental to the interests of the school”. Their forebodings proved correct and the initial rule that “no lady unaccompanied by a gentleman would be admitted after dusk” lapsed into the admittance of lots of women whose prime interest was not acquariums. One such lady, Emily Turner, was lucky. A “Major Hamilton” she picked up there and who offerred to set her up with rooms in Lambeth turned out to be the serial killer Thomas Neil Cream. He gave her pills to take which made her ill but they turned out not to be poisonous containing only quinine. She declined to identify Cream in court lest her lifestyle became public. Interesting facts: the Acquarium took only 11 months to construct compared with a period of years for later, smaller, buildings erected in Victoria Street right up to the present day. 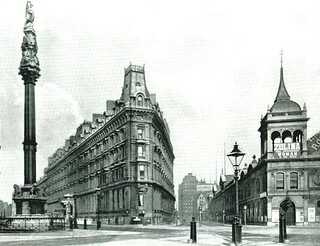 In the distance of the main photo down Tothill Street between Westminster Palace Hotel and the Acquarium is a block of flats which at the time of building in 1884 was the tallest, and in many critics eyes, the ugliest block in London. But, of course, they did not know what replaced it – today’s monolithic Home Office building.